Badlands National Park encompasses an area of dramatic landscape characterized by layered rocks, deep canyons & towering spires. Some of the most scenic areas of the park can be viewed from the Badlands Loop Road which winds past cliffs and offers glimpses of the bighorn sheep, bison & prairie dogs that call the grasslands home. 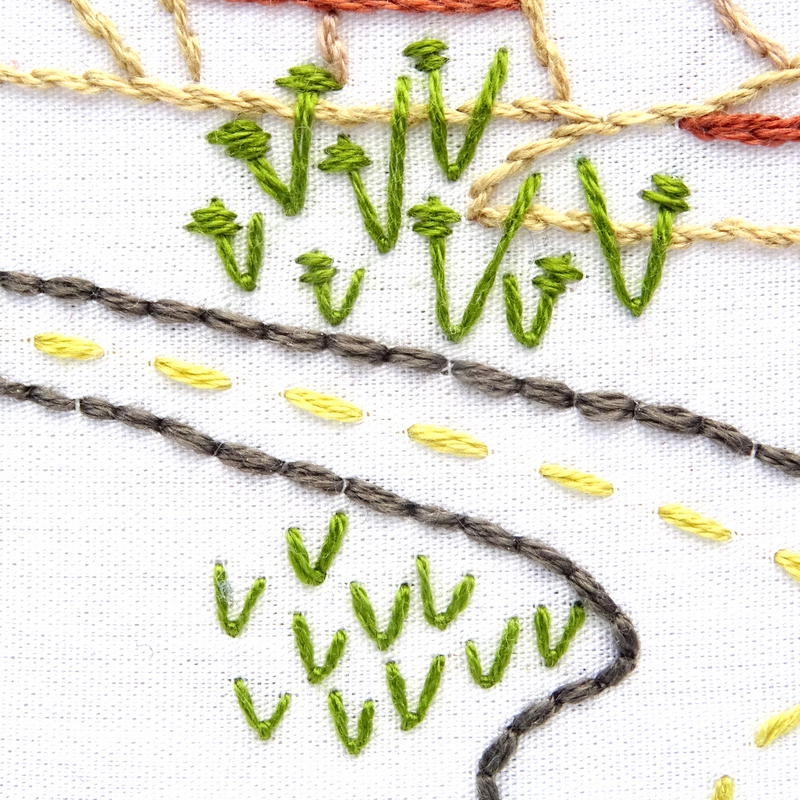 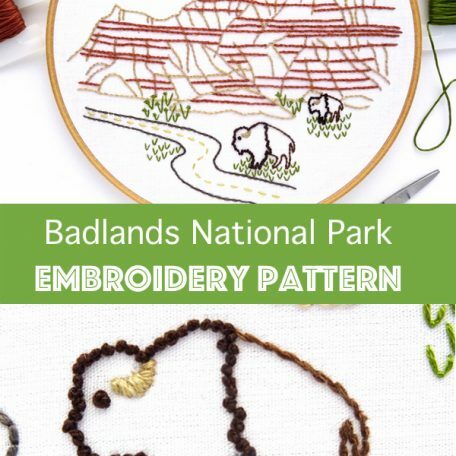 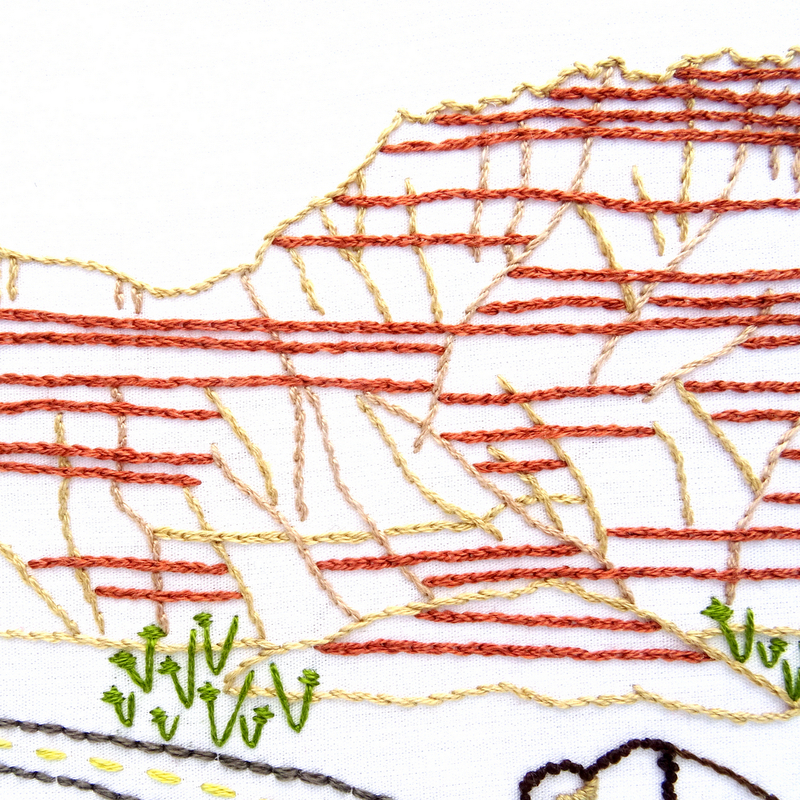 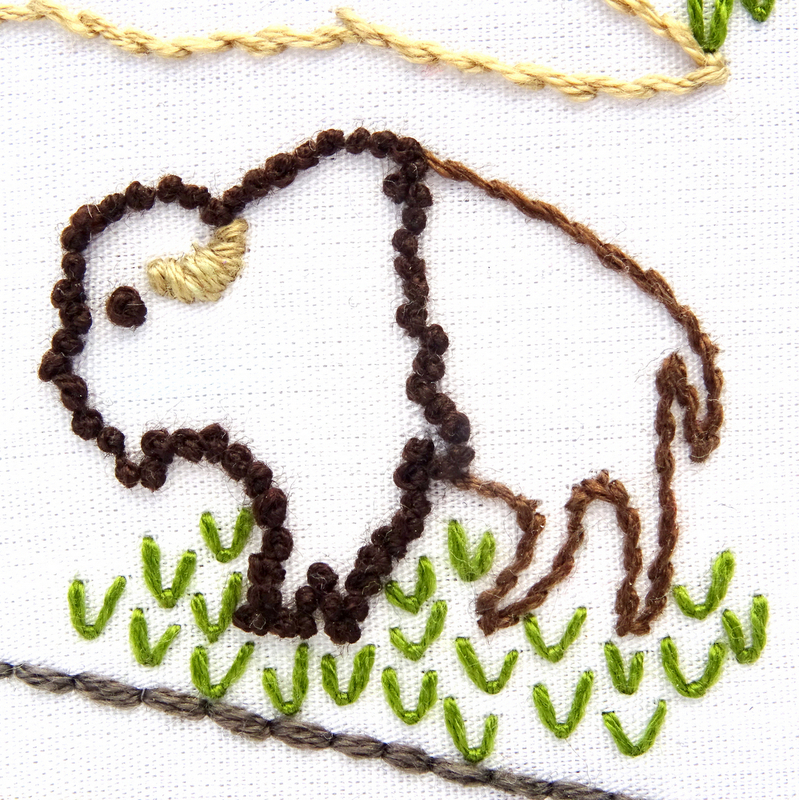 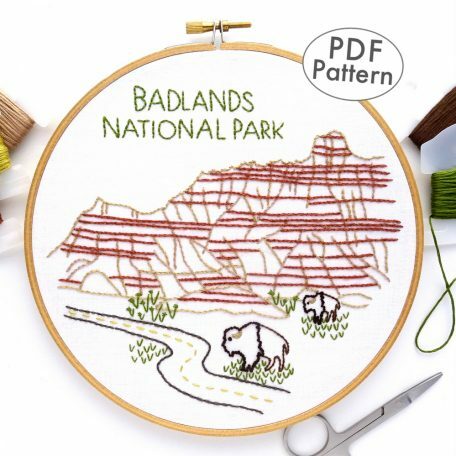 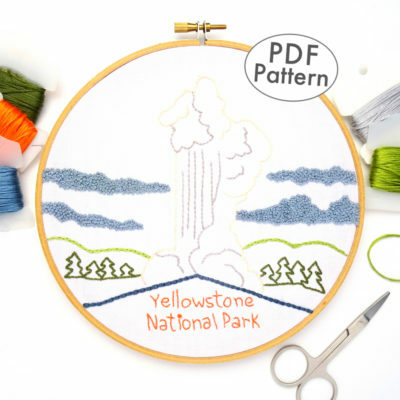 This one-of-a-kind embroidery pattern depicts the view from the road complete with grazing bison and colorful cliffs. 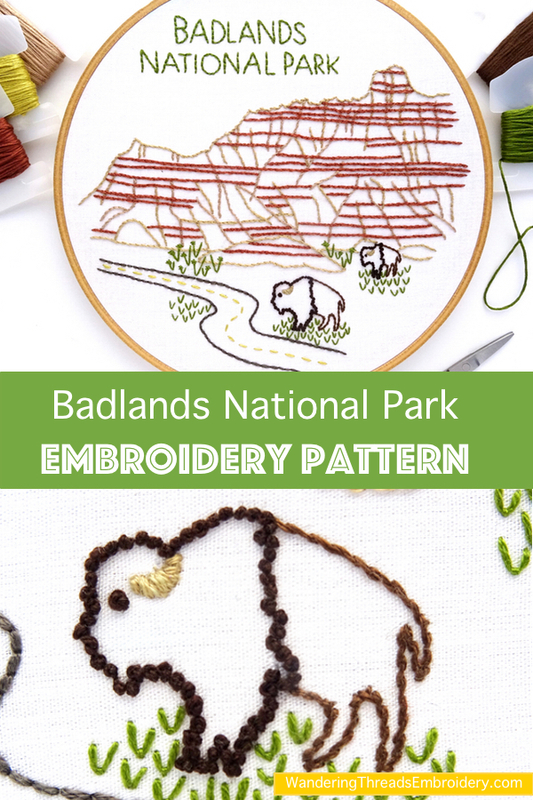 A fairly simple pattern, this design only uses a handful of basic stitches and is suitable for both experienced stitchers and those who are new to embroidery. 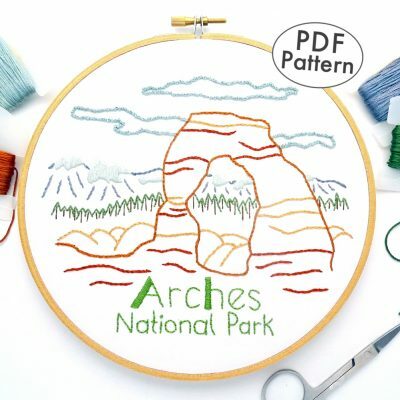 I fell in love with Glacier National Park during our first visit. 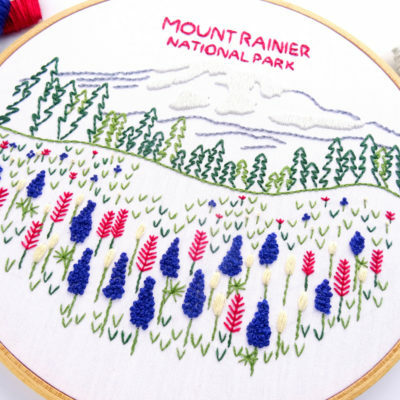 We stayed at a campground on the shores of Lake McDonald and every morning I wandered over to gaze at the crystal clear water set against a backdrop of jagged mountains. 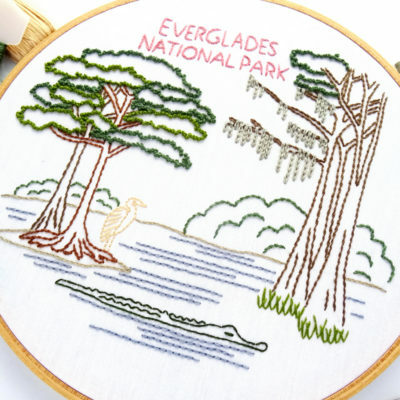 As much as the high mountain passes and abundant wildlife, this lake is an iconic symbol of the park. 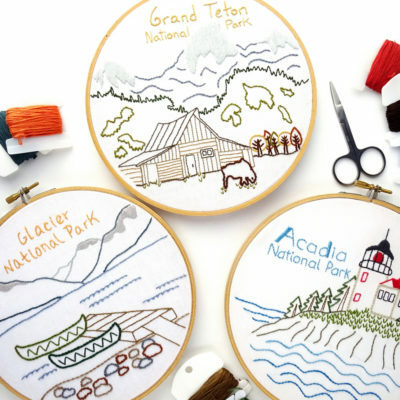 Capture the beauty of Lake McDonald and the spirit of the park with this simple pattern featuring snow-capped mountains, calm blue water, and canoes at the ready. 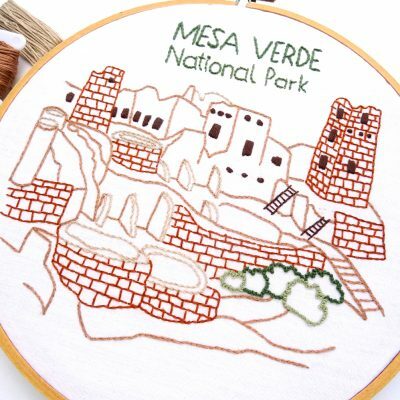 Mesa Verde National Park contains some of the best-preserved archaeological sites in the United States. 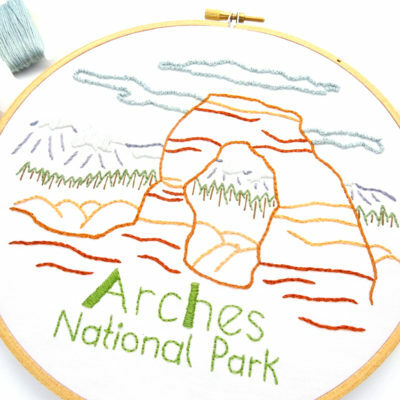 Millions of visitors every year drive the scenic park road, gaze out at the panoramic views, attempt to decipher the ancient pictographs, and hike among the famous Ancestral Puebloan cliff dwellings. 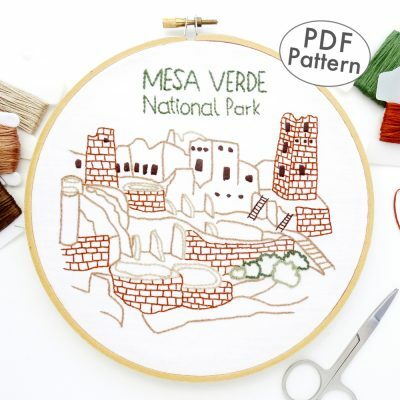 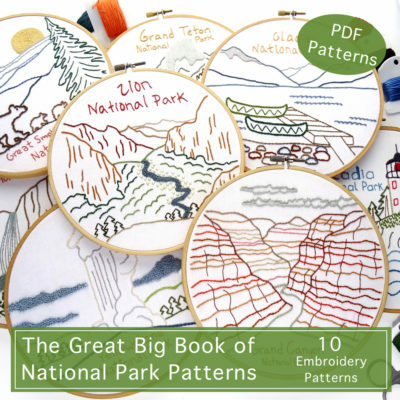 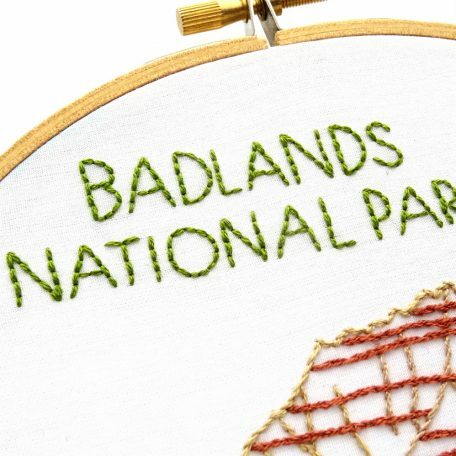 This one-of-a-kind embroidery pattern pays homage to the majesty of these cliff dwellings with a depiction of the largest dwelling in the park, the Cliff Palace. This is a beginner to intermediate level pattern that requires some knowledge of basic embroidery stitches. 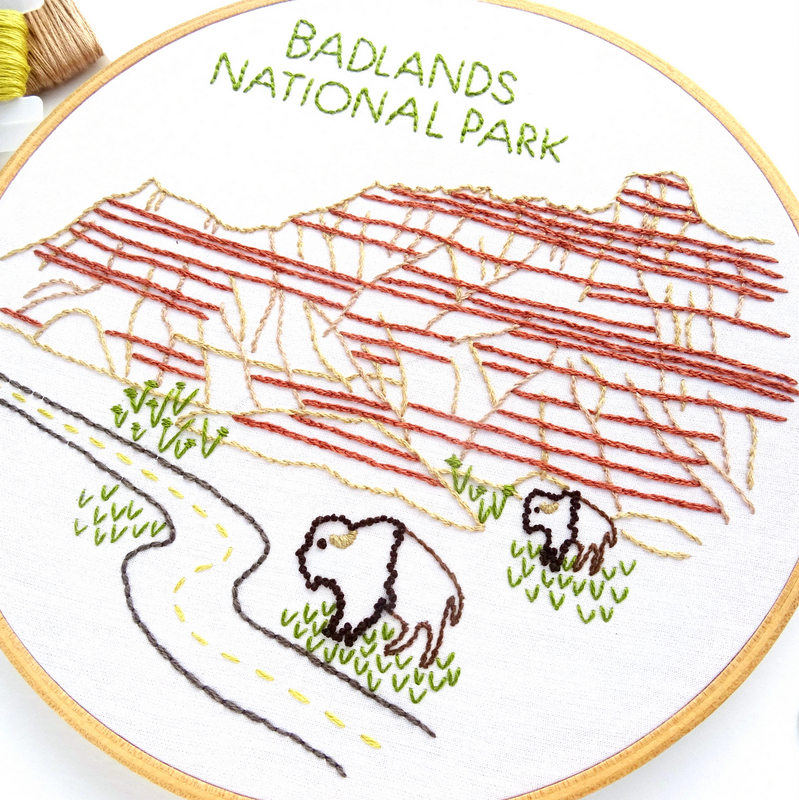 It might be the least popular of Utah’s five National Parks, but those who have visited Capitol Reef know that it has much to offer! Aside from the mind-blowing 90-mile long ridge of sandstone called the Waterpocket Fold that juts out of the earth and has eroded over time to form a jungle of domes, cliffs, and twisting canyons, the park also boasts a fertile river valley full of lush green cottonwood trees and rows of fruit trees planted by settlers long ago. 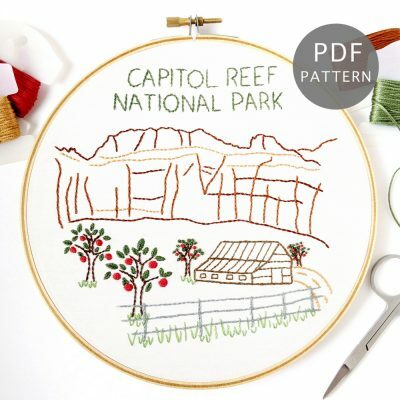 The Capitol Reef National Park pattern captures all of this and more with a classic scene featuring one of the apple orchards and a historic barn set in front of a towering cliff. 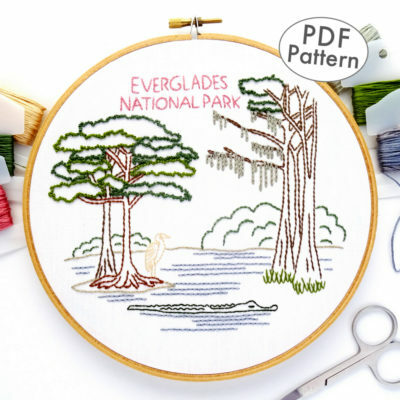 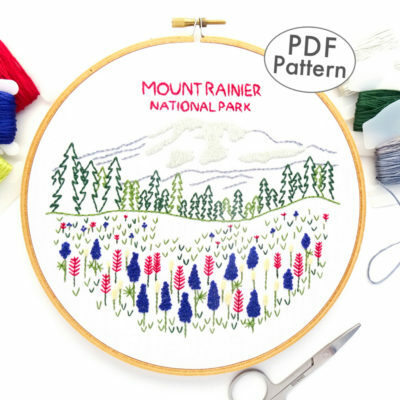 Designed with simplicity in mind, this pattern is perfect for both novice and expert embroiderers.